By Jack Kuhatscheck and Cindy Bunch. 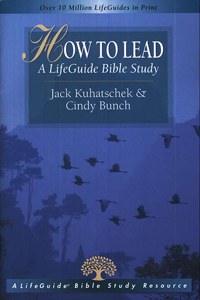 This guidebook by Jack Kuhatschek and Cindy Bunch (both veteran discussion leaders and experienced Bible study creators) will show you how to start a group how to decide what to study how to prepare to lead how to study the Bible how to use a study guide how to write your own questions how to lead the discussion how to evaluate the study Over 100,000 copies of this handbook (now revised and expanded from the original, Leading Bible Discussions) have been used by Bible study leaders and Sunday school teachers. Along with practical suggestions and the answers to common questions offered in each brief chapter, you'll find two appendixes: "Guidelines for Interpreting Scripture" and "A Sample Study." The resources section also leads you to more training guides, website references and study guides to use with your group.